Currently I am puzzled very much, which in-ear-headset (with mic and 1 button) is working with the FP2 and which not. The information about CTIA/OMTP and which smartphone model uses which standard, which headset have which standard…is confusing like hell! Only I know: FP2 needs CTIA and this, only partly useful list. 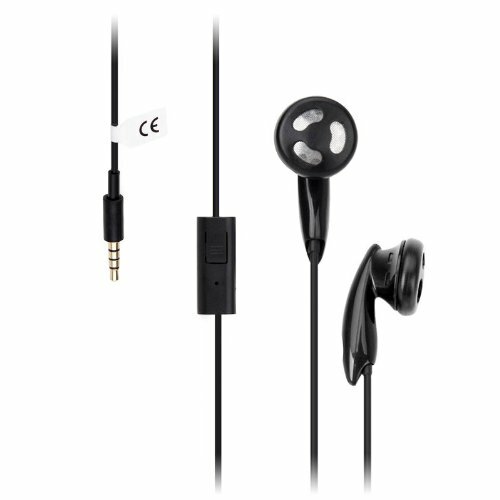 Wired in-ear stereo headset, with one button which work for calls, a mic, and from shop located in germany (not amazon). ANY HINTS? Can anybody help my out with this? Should ALL iPhone-Headset work with the FP2? I have bought 2 handsfree kits now and they don’t work. No one can hear me! I have a set of headphones that do seem to work, but I cycle and need earphones for under my helmet. Please help! It’s a real problem for me. I miss my family and friends!! Would you please add these to the (in-) compatibility list? But what a pitty, that they also don’t work. What I do not understand: the first (midnight raver) should work with iPod etc. and they do NOT work with FP2? As I stated above I already tested a Apple-suited-headset succesfull with the FP2…so why not this? Same for your second pair, the funny Bamboo things…should work with “Apple, Android, Blackberry,…” But not FP2? Is your experience same than for me? –> Only by pressing the call button (if available?) the sound is good. Otherwise the mic is working but you have a very ugly sound? I don’t understand why the producer/web shops don’t tell, which standard the headsets support like “CTIA” or “OMTP” not not "work for all smarphones, which is obviously not the case. Or do we still miss anything what is really wrong with FP2s audio jack? I am very angry about this, also not hearing anything form FP itself about this… @borjan, @MaartenD ?? My Sony MH 1C Smart Headset works fine. Volume and microphone buttons work with FP2. It is an older In-ear headset. But it works with the FP1 as well, only the buttons did not. The microphone itself sounds good. As far as I understand it this should not be possible? Accrrding to the wiki list of headsets that work, https://forum.feairphone.com/t/pencil2-list-of-compatible-headphones-and-headsets-for-fp2/12268, the House of Marley Smile Jamaica should work but I just bought and the microphone does not work. The mic on my old iPhone headphones also does not work. How do you know what Standard the headset has? this is not found on the packaging or website for the ones I just bought. How can I find something simple with a functioning mic?? I added the following entry a while ago. As mentioned there, look for Samsung Galaxy certified headsets, they seen to work fine. I would like to add this information in the wiki created but can’t figure out how to do it…someone can help me ? This was very helpful (though clunky), thanks! I was able to get this to work too. I made some more troubleshooting. For most headsets the mic is still not working at all which is a known problem with the FP2. I have tried Polk Audio Ultrafit 3000, a few Samsungs, a few Apples and so on. None working. The mic is working fine when I am using the sound recorder or RecForge 2 Pro to record sound. The sound is crystal clear. When making a phone call, the mic is not working. The reciever of the call can’t hear me but I can hear them. When recieving a phone call, the caller can hear me for 3 seconds and then it becomes quiet. I can still hear the caller. Remember, the HyperX Clud 2 headset was working fine with the FP2 in the beginning but suddenly this 3 second problem occured. Has anyone else with headset mic problems tested if the mic is working with a sound recorder app? As I wrote before, on my Kingston Hyper X Cloud II the mic is not working when recieving phonecalls but it’s working when recording with RecForge 2 Pro.